Make your customers remember you! Great reception desk giveaway! Looking for a unique promotional gadget idea for your company, agency, or organization? Whether for a colleague, client, charity, trade show, golf tournament, convention or any corporate event, our custom Juice-Jack Defender® is the perfect promotional gift. If you want to make an impact with your colleagues and clients, a unique, customized Juice-Jack Defender will definitely leave a lasting impression. Design your very own Juice-Jack Defender using your corporate colors and/or logo. Anything you or your clients want, we can produce – matching your organization’s colors and logo. Create your own promotional product with your university’s mascot, your company’s logo, or a snappy marketing slogan – your imagination will come alive as a useful and memorable product that won’t sit in a drawer or end up in the garbage can afterwards. Our customized products are manufactured just for you with the highest professional quality, including packaging. 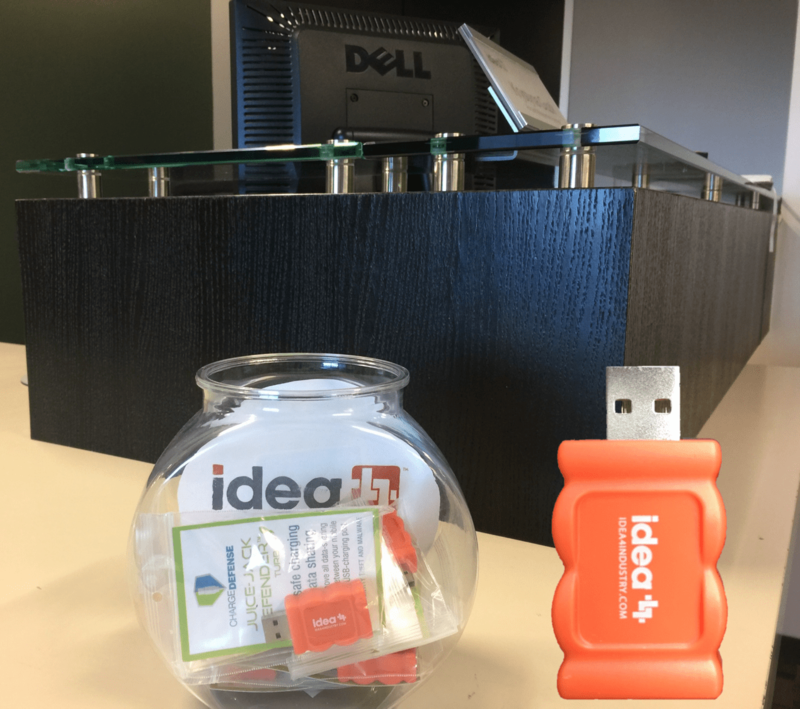 Great swag and something your customers and employees will use over and over to protect themselves from identity theft and malware – remembering you and your organization every time they pull it from their pocket, purse, or bag. 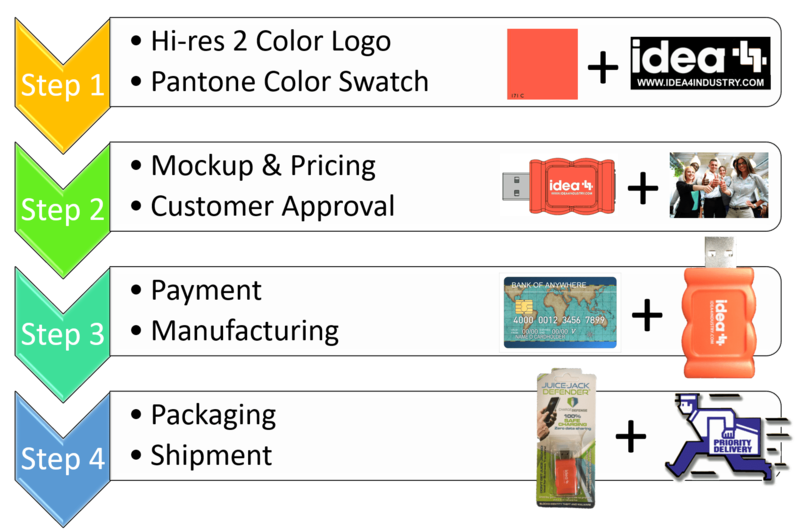 Step 1 – Email us a hi-resolution 2 color vector logo and a Pantone color for the case color. Step 2 – ChargeDefense will create a mockup and a price quote for you (usually same day) to approve. Step 3 – After approval, you make payment and ChargeDefense begins manufacturing (can take up to 8 weeks for delivery). Step 4 – We professionally package the customized promotional product and ship it to your location. We work closely and directly with C&S Sales, one of the top promotional products distributors for trade shows, corporate brand promotions, and conventions. They are experienced working with our products and can manage the entire process for you while you take advantage of their bulk discount rate. Please contact them directly at the address below . DISCLAIMER: This is for in-stock items ONLY – For C&S Sales orders, Juice-Jack Defenders are available only in our standard colors. For custom colors, you must work with ChargeDefense directly. Experimenting with doing your own customization on your Juice-Jack Defender®? 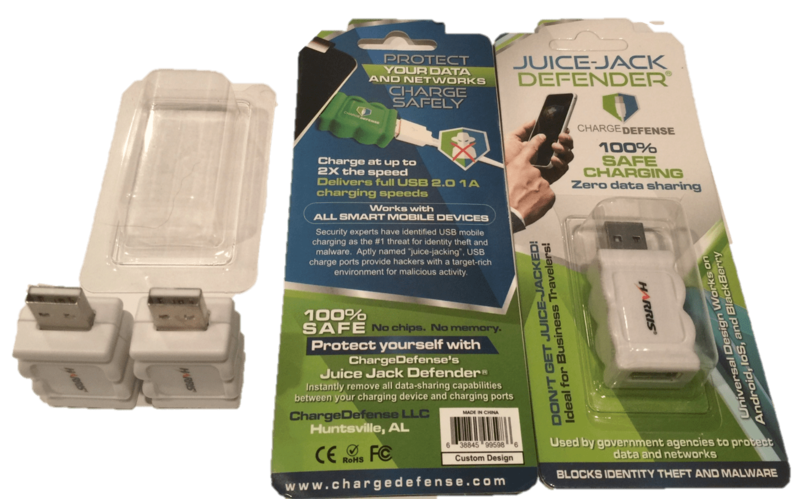 At ChargeDefense, we recognize that our Juice-Jack Defender® product is an ideal promotional product and we have no problem with placing your logo on the product. Our only caveat is that you may not scratch out, fill, or otherwise destroy our Juice-Jack Defender® Mark on the back of the product. If your organization requires written permission to create custom labels to lay over the top of the ChargeDefense logo, please draft a SHORT (no more than one to two paragraphs) legal request that includes the acknowledgement that there will be no destruction of our Mark on the back of the product, send to sales@chargedefense.com, and we will review it, sign it, and return it. This is not necessary, but we understand the requirements imposed by some company’s legal teams and are more than willing to support your organization. The above graphic information is provided to assist you in color-matching using our existing suite of colors. Bare in mind that these cannot be duplicated exactly in the injection mold process, but they will be close enough for most customization efforts. We appreciate your business and thank you in advance for your order.